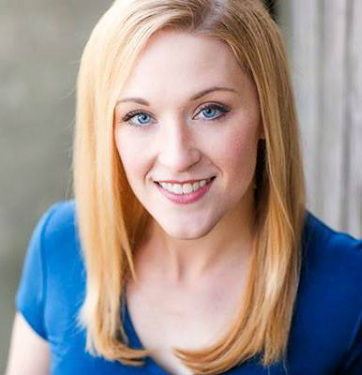 Jennifer Davies, soprano, is currently an active teacher and performer throughout the Portland area. Comfortable in both musical theater and operatic/classical repertoire, Jennifer has performed with companies such as Portland Opera (Carmina Burana), Opera Theater Oregon (Sophie in Werther/Out of Eden), Broadway Rose Theater (Evita, world premier and recording of Ripper, and Pinocchio), and was recently seen in Lakewood Theater's Side Door Staged Reading of Call Me Madam performing the role of Princess Maria. Past performances include Lakewood Theater's Grand Hotel as Trude/Operator, Kate/Judge/Sorority Girl in Pixie Dust Productions' Legally Blonde- The Musical, Ensemble/Munchkin/Tree in The Wizard of Oz, and Rosa Budd in The Mystery of Edwin Drood (Lakewood Theater). Other operatic roles include Valencienne in The Merry Widow (Portland State Opera) and Nannetta in Falstaff (Portland State Opera). She has also had experience as a concert soloist, performing as the soprano soloist in Handel's Messiah with Anna's Bay Center for Music (Union, WA) and Village Baptist Church (Beaverton, OR), in Faure's Requiem with Lake Oswego High School, and in del Tredici's Dracula with Portland State University's New Music Ensemble. In October 2013, she will be performing in Stumptown Stages' production of 9 to 5: The Musical, and soon after that will be a "Silly Girl" in Disney's Beauty and the Beast with Pixie Dust Productions in December 2013. As a teacher, Jennifer is an active member of the National Association of Teachers of Singing (Cascade Chapter), serving on the chapter board as Communication Liaison and in the Membership Committee. She has had the privilege of teaching private voice for the past few years to students from both the Portland and Salem areas, and has worked with and coached some of the top high school and middle school choirs in the state of Oregon. Jennifer has extensive experience teaching both drama and voice classes for middle school through college aged students, and has also vocal directed for musical productions with Christian Youth Theater (Beaverton), Theater Outreach (Salem), and West Linn High School. Jennifer has also served on the faculty at George Fox University teaching Musical Theater Performance. Jennifer received her Masters of Music in Vocal Performance from Portland State University, studying under Christine Meadows and Douglas Schneider. She earned her Bachelor of Arts in Music (Vocal Performance emphasis, minor in Theater Performance) from George Fox University, studying with Cynthia McGladrey. Past awards for her performances include 3rd place at the NATS Cascade Artist Award competition (2012), the Ruth Dobson Award for Outstanding Operatic Achievement (Portland State University, 2010), the OTAS Award for Best Supporting Actress (Rosa Budd in The Mystery of Edwin Drood, Lakewood Theater), NATS Cascade Chapter student competition winner (Musical Theater and Classical divisions), and an Irene Ryan candidacy for the Kennedy Center American Collegiate Theater Festival (Mary Lennox in The Secret Garden, 2007).